See how our next-generation platform provides access to Fidelity tools and third party solutions — all from one location. Helping you focus on deepening client relationships and growing your business. Backed by Fidelity's commitment to an open architecture experience. Note: The solutions above feature both Fidelity and third-party resources. Introducing WealthscapeSM, the total advisor platform that gives you access to our leading-edge technology, tools, and third-party integrations. Explore each solution to learn more. Count on Fidelity for comprehensive brokerage solutions to run your business. Clearing and custody services help you meet a wide range of needs, including: transactional settlement, financial communications, service and operations, as well as FDIC, cash credits, and core sweep services. Core platform functionality includes account opening, trading solutions, cashiering, reports and alerts, market data and research, modeling and rebalancing, and risk management and compliance tools. Mobile capabilities provide you access anywhere, anytime. You can also take advantage of our Remote Check Deposit functionality. Investor portals enable you to give your clients online account and document access, trading capabilities, and more. Through deep integrations between Fidelity and eMoney1, advisors will now move easily from planning to action, and provide a modern, digital experience to end-investors. Our end-to-end investment management solutions can help meet your firm's enterprise needs and help your advisors serve more investors. As one of the world's largest providers of financial services — and the individual and workplace retirement market leader — we are strongly positioned to help you grow your business. Fidelity Automated Managed Platform (AMP), co-developed with eMoney1 is a planning led digital advice solution that helps you manage automated and fully-advised clients side by side. You can also access deep integrations and digital APIs (application programming interfaces) with select third party software providers. Drive smarter operations for more efficiency, faster growth, and better risk management. Simplify the advisor experience and make it even more productive. Aggregate data on an ongoing basis from multiple sources, including: Fidelity data, assets under administration, client-permissioned data, market data, customer relationship management (CRM) data and firm-provided data. Data will be normalized and streamlined across sources. Then, if necessary, an analyst will remediate data issues to help better achieve accuracy and completeness. Analyze data from books of business and help develop new business insights. An offering which explores how quantitative techniques, including artificial intelligence, machine learning, and predictive analytics, can help advisors save time, grow their businesses. The first solution within Insights + Analytics will be a set of book analytics capabilities which create a "story-based" interface that helps advisors answer real business questions. Learn how analytics and AI may play a role in the future of the advice business. Optimize your existing systems and pick the integrations that fit your platform with our Integration Services and Third-Party Tools. 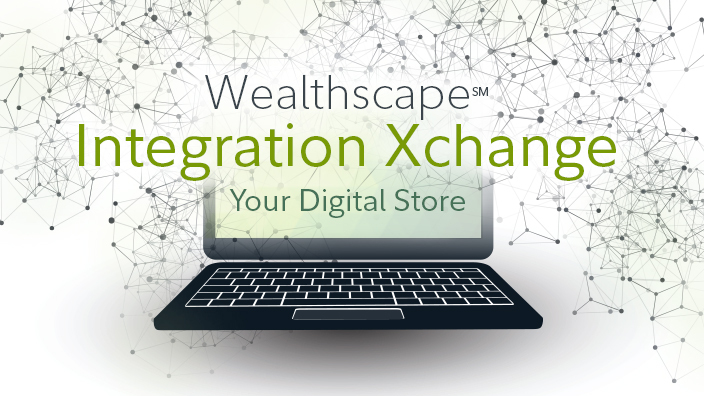 Integration Services — Delivers direct access to Wealthscape and helps you support your platform with data and transactional capabilities through an efficient and secure onboarding experience. Third-Party Tools — Streamline your workflow with integrations between Fidelity and third-party software. Harness technology effectively — Wealthscape reduces complexity so firms and advisors can be more efficient and productive. Change is the new constant — Wealthscape keeps you informed and prepared, with resources to help you and your business stay current and address your evolving needs. The marketplace is constantly shifting — Wealthscape provides a suite of modern solutions to help you broaden your client base and deepen existing relationships. 3. Accessible through Wealthscape, which is an online brokerage portal, may be offered by either Fidelity-affiliated companies or non-affiliated third parties through a single sign-on.